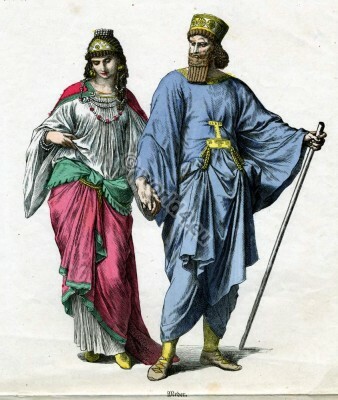 Costumes and court dresses of Medes nobility. Home » Costumes and court dresses of Medes nobility. Costumes and court dresses of Medes nobility. Ancient female and male clothing. This entry was posted in Ancient, Asia, Court dress, Hairstyle, Headdresses, Middle East, Nobility and tagged Ancient Medes costumes on 4/17/13 by world4.